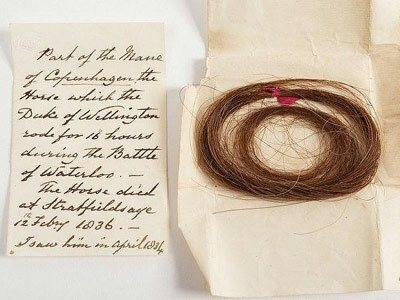 A lock of hair from the Duke of Wellington’s celebrated horse, Copenhagen, is about to be auctioned in Britain. The lock, with provenance in the form of a handwritten note from Lord Fortescue of Castle Hill, carries a pre-auction estimate of £3000 to £5000. The lock will be offered on Wednesday during Bearnes Hampton and Littlewood’s antiquarian books, maps and prints sale in Exeter. Lord Fortescue’s note explains that the hair was taken from Copenhagen’s mane. The Duke of Wellington rode the liver chestnut stallion during the 1815 Battle of Waterloo. Copenhagen carried him continuously for 17 hours and finished the world-changing battle uninjured. The horse was retired to the duke’s estate, Stratfield Saye House. A marbled headstone marks his grave. The lock of hair was chance find by Lady Arran of Castle Hill, who was sorting through some family papers. Lady Arran told local media it was an extraordinary find, especially given that this year marks the 200th anniversary of the famous battle. She said now seemed a good time to find the lock of hair a new home with someone who would cherish it. Copenhagen was of Anglo-Arab breeding. He had an early racing career before serving in Spain during the Peninsular War. He was subsequently sold to the Duke of Wellington. The duke rode him during several battles in the lead-up to Waterloo. The horse was retired to the Duke’s Hampshire property, dying at the age of 28 in 1836. The auction can be viewed here.